Today sees the latest point release in the roadmap of German developer MailStore, and in addition to a long list of fixes there are a couple of interesting new developments which have caught our collective Zen Software eye. 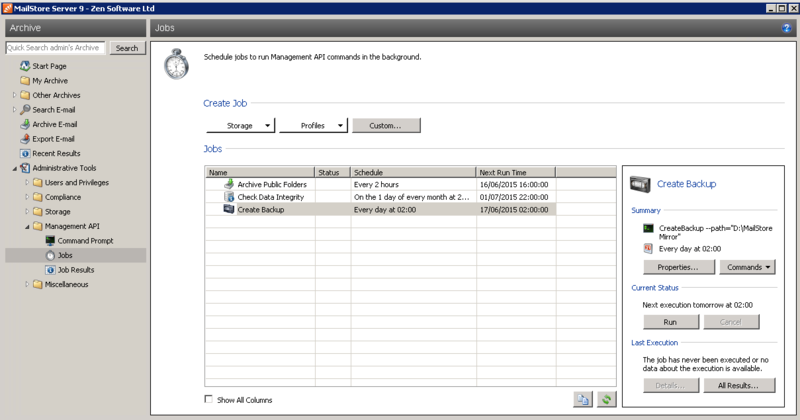 As you may already be aware, earlier versions of MailStore made use of the Windows scheduler to control and organise tasks. In the last major release, we moved away from using it to control the archiving jobs themselves, instead upgrading to a more efficient system that continually updates the archive data throughout the day. Today’s release sees that taken a step further as we move completely away from reliance on the Windows tool to a totally independent scheduling system developed by MailStore. It’s now very straight-forward indeed to create a backup routine for your MailStore archive data. Use the MailStore GUI to set up a scheduled backup which first takes an initial full copy and later updates that with the incremental changes. This feature is designed to enable you to create a fast, automated mirror copy of your archive in another location, ready for inclusion in your routine backup schedule using either BackupAssist, another 3rd party tool or Windows built-in backup. MailStore now has the ability to perform any of the management functions previously available by API (there’s an exhaustive list of API commands on MailStore’s web site). What we think is likely to appeal most to you is those tasks which keep your archive healthy and efficient, all of which can now be automated within the software. This includes the scheduling of various database maintenance to run in unsociable hours, so tasks such as integrity checks, compression and re-indexing of email. They’re also many of the things even we’ve neglected to do in the past but that will definitely have a positive impact on performance. Your main archiving routine is ideally something you want to set and forget. However, outside of that, if you’ve got any more niche requirements you can want to cater for it is now possible to do set up individual jobs to do things like archive remote IMAP accounts or run a pruning policy on specific mailboxes. Microsoft have just announced some improvements to their archiving features, but the appeal of using MailStore with Office 365 still remains. It’s essentially spreading the risk and reducing the total reliance on a cloud provider for storage of your businesses email. In the past you would have needed to either create users manually in MailStore, or linked them to a local Active Directory account in order to create them. In version 9.2 you’ll find MailStore will synchronise directly, which means it’s very simple to manage users automatically, particularly handy for small businesses running either a cloud platform server or workstation O/S. See this guide on MailStore’s web site for more details. If you’re new to archiving Office 365, there’s a setup guide here and you might also find this recorded webinar of interest. If you use either the Outlook Add-in, desktop client or web client, and find you’re performing searches which bring back large numbers of results, you’ll be pleased to hear that MailStore is now much better at dealing with those. Don’t forget to update your add-in or client if you’re upgrading the main server version! MailStore partner with the Exchange Alternative, MDaemon Messaging Server. The already excellent integration with MDaemon is topped off in this release by the announcement of full 64-bit support. For full details of every update in this release, please see the release notes. For the latest installation files see our downloads page.